Let us begin with a fact that whole legions of global warming alarmists cannot wish away or hide from public view. The Earth has been cooling since 1998 and it is getting demonstrably cooler almost everywhere in the world. The cooling will continue for decades. So it follows that the best way to be a complete jerk is to have your book, “Climate Cover-Up: The Crusade to Deny Global Warming”, published at the same time that a recent Public Strategies Inc/Politico poll revealed that “Just four percent (4%) ranked climate change as the top issue. James Hoggan, the cofounder of DeSmogBlog, along with Richard Littlemore are the proud authors of what has to be the silliest book of the year. It actually has a blurb on the back cover from Leonardo DeCaprio, famed actor and, until now, an unknown meteorological savant. In the interest of full disclosure, both Hoggan and I have plied the magical arts and craft of public relations for a living. Thanks to Obama’s stimulus, clunkers program, ownership of General Motors and other former private enterprises, I have been forcibly retired. I am looking forward to not being retired as I have rent to pay and enjoy eating on a regular basis. Did he say “journalistic watchdogs”? Last year more than 40,000 of them lost their jobs due to an ailing economy, bad business models, and the growing perception that the “news” they were reporting was biased and unreliable. To this day, reporters are still writing about “global warming” as if it is real and blathering about greenhouse gas emissions as if they have anything to do with the climate. From Hoggan’s description I thought he was talking about the huge global warming hoax that has been foisted on the world’s population by the United Nations Intergovernmental Panel on Climate Change, Al Gore, countless feckless politicians, grant-seeking scientists, and so-called environmental organizations. Climate “science” based on appallingly manipulative and misleading computer models is controversial. As for “climate change”, it is the new term being used by “global warming” alarmists because there is NO global warming. Oh wait, it turns out that the President of the United States, speaking at the Massachusetts Institute of Technology, was critical of the “naysayers” who “make cynical claims” that ignore the alleged scientific evidence about greenhouse gas, i.e., carbon dioxide, emissions. Move over Hoggan, it turns out that Obama is as big a jerk as you. Obama has been touting “clean energy” technologies such as solar and wind that are so wanting in practicality and dependability that only government requirements keep these providers of barely one percent of all electricity in business. As part of the stimulus and the horrid Cap-and-Trade bill lingering a slow death in Congress, billions of taxpayer dollars would go to “clean energy” companies while the Obama administration wages an economic war on coal and oil companies, denies permits to mine coal, the opportunity to drill for oil in Alaska or in 85% of the nation’s continental shelf. If coal and oil companies that provide 99% of our power for transportation and all other uses are evil, then surely General Electric that manufactures wind turbines and stands to make a lot of money thanks to a government ban on the manufacture and use of all incandescent light bulbs is the epitome of all that is good and wonderful. Oh, those terrible human beings who want a standard of living that includes electric lights, television sets, computers, air conditioners, automobiles, and a dinner that does not require burning animal dung to cook. Maybe Hoggan is bucking for a prize for publishing one of the most idiotic books of the year, ten years into a worldwide cooling of the Earth. Great article. 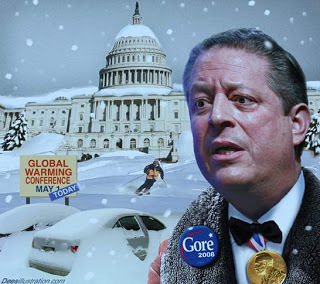 Lord Monckton is driving the global cooling deniers crazy with the truth right now. Here are some of his works and activities. Enjoy! Previous Previous post: Carbon hypocrites, tax grabbers or power seekers?